It is known and really irritating that when we finish installing a new update for our computer or for any other device, we are asked to restart our device in order for any kinds of updates to be finished. It is for sure really irritating, but it is something that must be done, or not? If you do not do it, it is sure that a message will appear on the screen of your device that will say when you want to be informed about the restart, in 10 minutes, 1 or 4 hours. Many computer users and especially people who use Windows, dislike this feature and they are trying to find ways to disable it. There are ways that you can achieve that especially if you are a businessman who wants to have his computer available 24 hours. 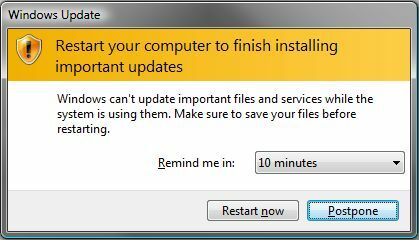 There are two ways to do it and the first one requires to stop the Windows Update service for the current session. All you do by using this way is simply the block of the prompt and the stop of any other attempt to install any new updates that might appear until the computer is rebooted. Open a command prompt window by clicking the “Start” button. Enter cmd in the search form and push at the same time Ctrl,Shift and Enter button in order to open it with administrative privileges. After that run the command net stop “windows update” to stop the Windows Update and the service for the current session. If you regret it, you can restart the specific service just by running the command net start “windows update” and the service will start running again the next time installing a new update. Use Windows+R in order to be able to appear the run box. After that enter regedit and push enter and the Windows Registry Editor will be open. The next move that you need to make is to navigate to HKEY_LOCAL_MACHINE\SOFTWARE\Microsoft\Windows\CurrentVersion\WindowsUpdate\Auto Update and find the ‘ForcedReboot’ key in order to change its value to “0“. It is really important to always have in your mind that this procedure can be done on Vista, Windows 7 and other new operating systems. There is also another option that you can use that is the final one that is available in some versions of Windows system. Enable the first one and organize the second one to the period of time that you want. It is sure that whichever way that you will choose the disable of the restarting of your computer after the installation of updates will be achieved. Follow whichever way that you want and it is sure that you will never regret it. Ali Qamar is an Internet security research enthusiast who loves the tech overall, too. The ultimate goal of Ali is to help folks over the Internet. He is passionate about sharing knowledge with people and always try to give only the best.